This is a sponsored post from Robin McGraw Revelation. All opinions are my own. Dr. Phil’s wife, Robin McGraw, launched Robin McGraw Revelation’s Luxury Skincare Collection in 2016. Her full line of skin care products are free of harmful sulfates, mineral oil, parabens and chemicals. All products are also formulated without animal testing. I love this about her product line! With this amount of integrity and gorgeous packaging, they immediately caught my attention. Powered by their innovative Dynamic Infusion Technology, their formula delivers a potent blend of five skin-smoothing, anti-wrinkle peptides and hyaluronic acid deep into the skin faster than traditional skincare to hydrate as much as possible. This luxuriously lightweight cream also features jojoba esters with moisturizing vitamins A, D, and C, plus free radical blocking, anti-aging vitamin E-rich sunflower seed oil to provide intense healing and hydration without the sticky after feel. Rich in vitamins A, K and E, this natural emollient keeps your skin hydrated and protects against free radicals. 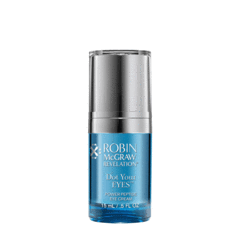 This tightening eye cream takes a multi=action approach to refreshing, tired eyes, combining cutting-edge skincare science with potent botanical ingredients to improve skin at the cellular level. This is the first product formulated using their innovative Dynamic Infusion Technology, a proprietary chemistry formulation technique that allows optimal penetration of ingredients into the skin—26x faster than traditional skincare formulations! 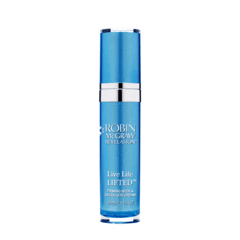 A unique 5 peptide complex reduces the appearance of puffy eyes, dark circles and fine lines while assisting in natural collagen production to tighten puffy and sagging skin. Powerful combination of cutting-edge skincare science and potent botanical ingredients including Persian Silk Tree Extract, Peptide Complex and Lecithin. In 2014, Robin founded the Robin McGraw Revelation Lifestyle Brand with a mission to encourage women to believe it is not selfish to put themselves first, to understand that they deserve to embrace their own beauty, health and happiness, and to know they must take care of themselves in order to take care of those they love. In 2016, she founded Robin McGraw Revelation’s Luxury Skincare Collection. Her products have been spotlighted in The New York Times, Redbook, Allure, People Magazine and more. What do you think about this skincare line? Would you like to purchase some of her products? There’s a link below to the best price on Robin McGraw Revelation. Thank you for sharing some of your time with me today. Coming up next on The Badass Writer: A peek inside the novel Frozen Butterflies, a look at Self-Made Cosmetics and a review on the Revolution Mint Palette. Stay tuned!